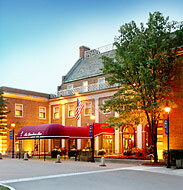 Now a Marriott Hotel, the Dearborn Inn was built by Henry Ford in 1931 as the first airport hotel in the United States. Set amidst 23 acres of country gardens, the inn is just steps away from The Henry Ford Museum and Greenfield Village. The red brick Colonial style building offers all the amenities of a Marriott while still retaining the historic aura and intimate comfort of a bed and breakfast. 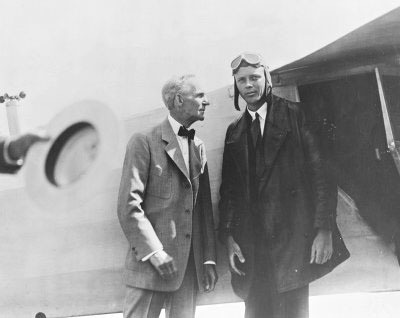 Henry Ford and Charles Lindbergh at the Ford Airport in 1927.